Learn how to describe what type of pond algae you have in your pond. Green water*, is probably the most common pond algae issue that pond and water garden owners face at sometime and thankfully one that can be eliminated! Green water is not necessarily bad for fish or the overall health of the pond, but it sure is not what we’re hoping for when our ponds were installed. The shades of green water can vary from a deep green/black to a bright lime green color. Green water is created by plan ktonic algae cells suspended in the water. The green water condition in backyard koi ponds and water gardens is typically a symptom of an under filtered pond. The nutrient levels (a.k.a algae food) in your pond are rising faster than the filter system can break them down. This excess of nutrients gets consumed by the planktonic algae, they become fat and happy pond algae cells and turn green. And in turn your pond water turns green. These little tiny floating plants are just doing what plants do, and turning green by producing chlorophyll. Temporary greening may occur from heavy rains that are rich in nutrients (nitrate) or water changes which sometimes contain phosphate. This temporary greening will usually come back into balance in a short time. Chronic green water lasting 3 weeks or more, needs to be addressed. String / Hair / blanket algae blooms can occur for much longer periods of time than the issues of green water or floating algae. Its appearance is long hair like strands growing on the surface of liner, equipment, rockwork, and/or plants. 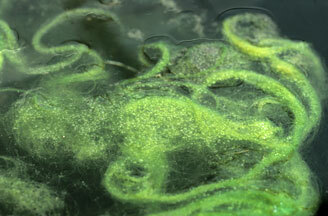 It can grow in dense matting or have sparse growth; but this type of algae is always attached to a surface. 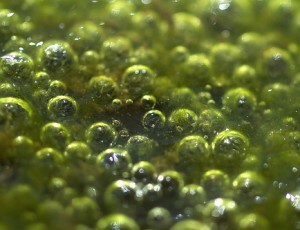 It is the most common algae that occurs in stream and waterfall areas of your pond or water garden. String algae blooms are a common (normal) occurrence in early winter and early spring/late winter, but can persist year round in problem cases. String algae in small blooms do not cause any immediate health issues to the livestock in your pond or water garden, but long lasting blooms are highly undesirable and can cause pond issues as serious as livestock loss if not addressed. The early winter bloom likely occurs around the time that the aquatic plants in your pond have stopped “eating” and are getting ready for dormancy, microbial processes within the pond have slowed, Mother Nature is raining down all the leaf and plant debris she can into your pond, and materials are not breaking down efficiently which raises nutrient levels. The pond suddenly has a nice glut of food (nutrients) on the market and algae are willing to exploit that. With an abundant food supply and no other plant competition, the string algae bloom is underway! Typically in a few weeks it lessens or clears up. In early spring the aquatic plants have not woken from their winter slumber, most filters have not been serviced all winter, old man winter has dumped several months worth of debris into your pond, temperatures start rising and again algae finds a huge food supply all to itself this time of year. BAM! String algae bloom underway. 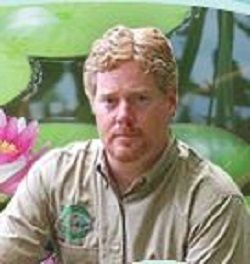 Many pond pros are proponents of the “let it bloom and fade” method. 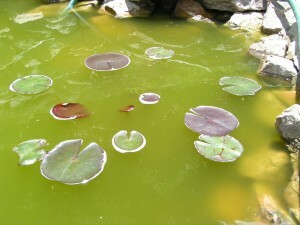 For others the pond algae bloom can be manually removed and treatment applied. Floating algae is the least common algae that occurs in most koi ponds and water gardens; especially ponds that use skimmers as a part of the filter system. It appears as a “puffy” type of pond algae with a brown/green color and is of course, floating. The floating algae that we see in our koi ponds and water gardens usually occur in “dead zones” of circulation, very shallow areas, and ponds that are in real need of cleanout. Like string algae, floating algae can occur in green water conditions or when pond water is very clear and otherwise healthy looking. Floating pond algae in natural ponds, and farm ponds is a much more common occurrence and is often accompanied by string algae growth and green water conditions. Floating algae is very unsightly, but also the easiest to get rid of. that about 8 oz – 1 x weekly. am on third dose next week. still green h2o. that i needed to get pennywort growing in pond AND string algae. i asked why string algae? the reply was …”you cannot have both at the same time”. i assume she means that re-growth of plants plus growth of string algae would help to eradicate the planktotic algae. i have never heard or read that string algae was beneficial in this particular way. would very much appreciate your thoughts on this. and how long we & the koi have to live with this situation. many thanks. Feel free to email me directly if you would like to include photos, etc. i have experienced a situation in which green algae turns brownish red during the day light (sunlight may be) and again turns green after evening in a pond. I am not getting why this is happening. please explain this phenomenon?